I had my color class with the Nautilus Quilt tonight, and it went very well. We were doing analogous colors, which is a run of colors adjacent to each other on the color wheel, but only including 1 primary. So my color run was blue-green, green, yellow-green, yellow, yellow-orange, orange, orange-red, seven colors with yellow being the primary among them. The background is a very light yellow green, it doesn’t show up as well as I would like in the picture. Here is the mama nautilus. Close up of the tentacles. It was really interesting, because there were about four of us who did this same color run, and there were four TREMENDOUSLY different quilts. I put mine up and talked about it, and then another student said she used the same colors but she didn’t like hers as well as mine, and so the teacher had her put hers up next to mine. Now, obviously, it didn’t have tentacles, but it was a very nice quilt, the teacher suggested some design things she could do to make it so she would like it better, and then we had two more quilts put up on the wall with the first two, so that was a really cool way to do it. 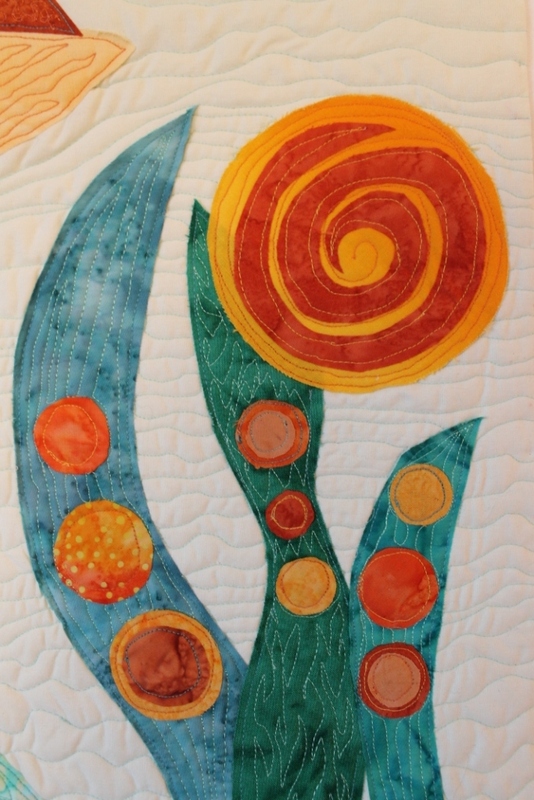 I got good compliments on the design, the colors and the quilting. This is the most “all me” thing I have made so far, and I really really enjoyed it. I can’t decide if I should stick to the tentacle theme now. 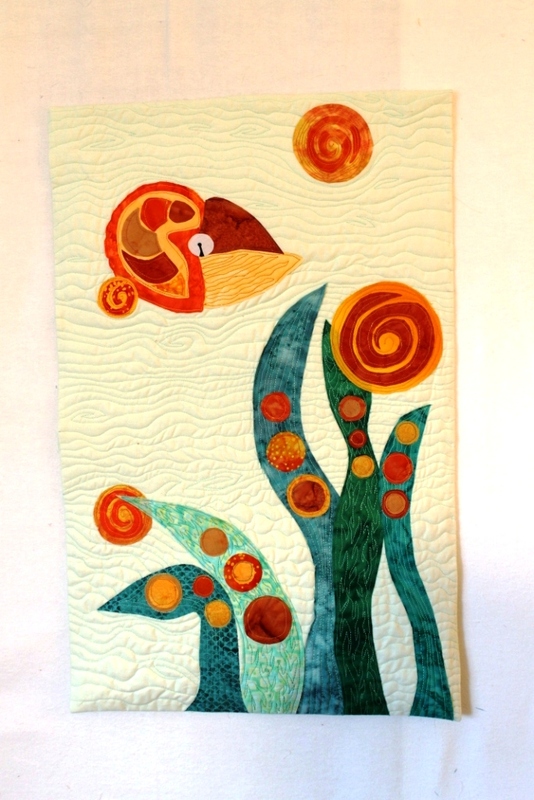 I like making pieces that have something “out of place.” This one was out of place because quilts don’t usually have tentacles. 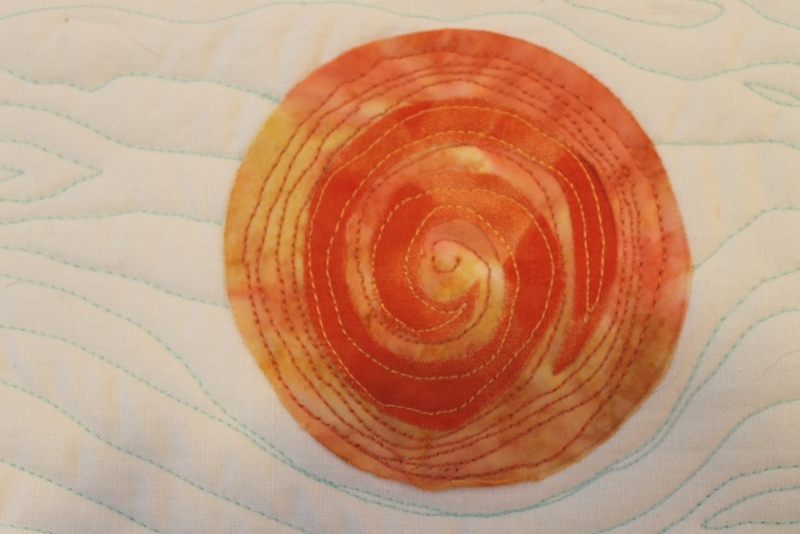 Now, a quilt has tentacles, so I would have to do the next one putting two things together that aren’t usually together. For example, I put this little (not complete) sketch together this afternoon. 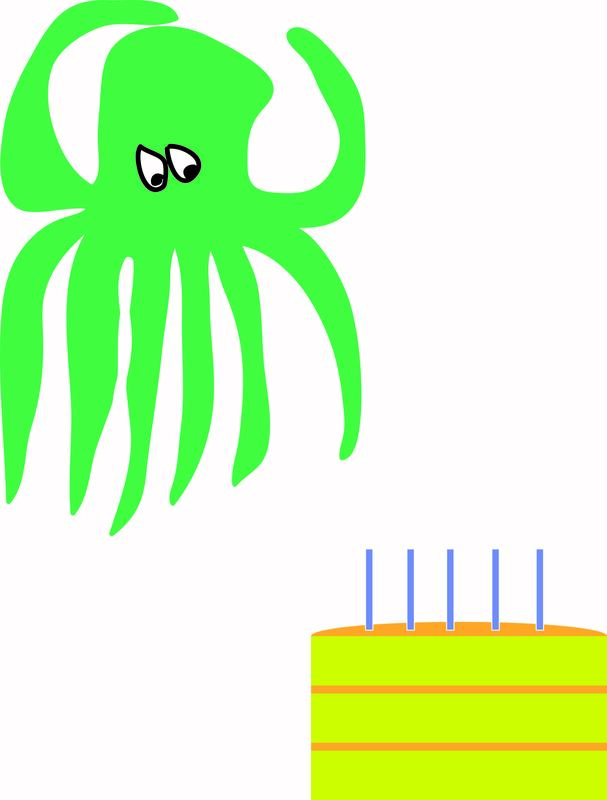 I call it “Octopus Eying Birthday Cake.” This is the sort of thing I enjoy. So perhaps the Triadic Color Scheme project will be an octopus and a cake, or a still life with newt. I will have to think on it a bit. One thing I noticed (as I was looking in particular at still life paintings from the National Gallery and American Gallery) is that many still life paintings have oysters in them. Why is this? 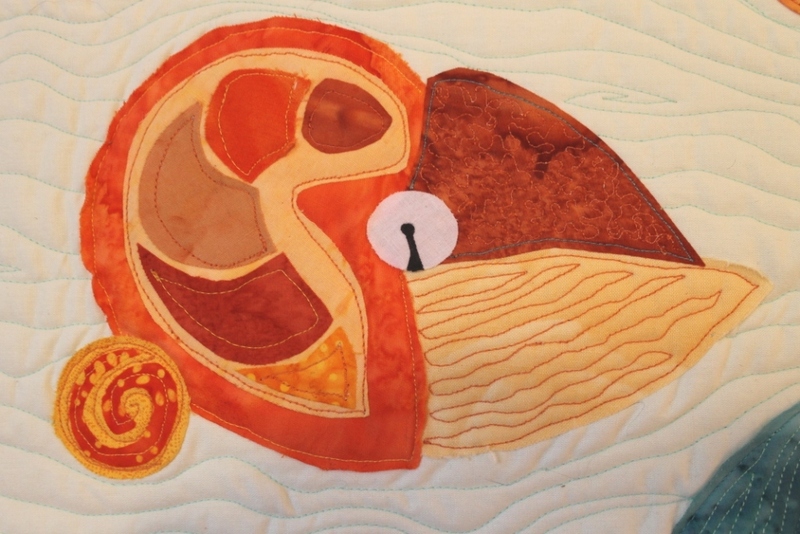 An oyster would be interesting to put on a quilt, too. Of course, many of them also have dead birds and/or fish, but I don’t find that as interesting as oysters. Or newts. You certainly can think up some good ones! Nice quilt!